2019 Irrigation Season will start April 24th. The Upper Rogue Independent is incorrect. 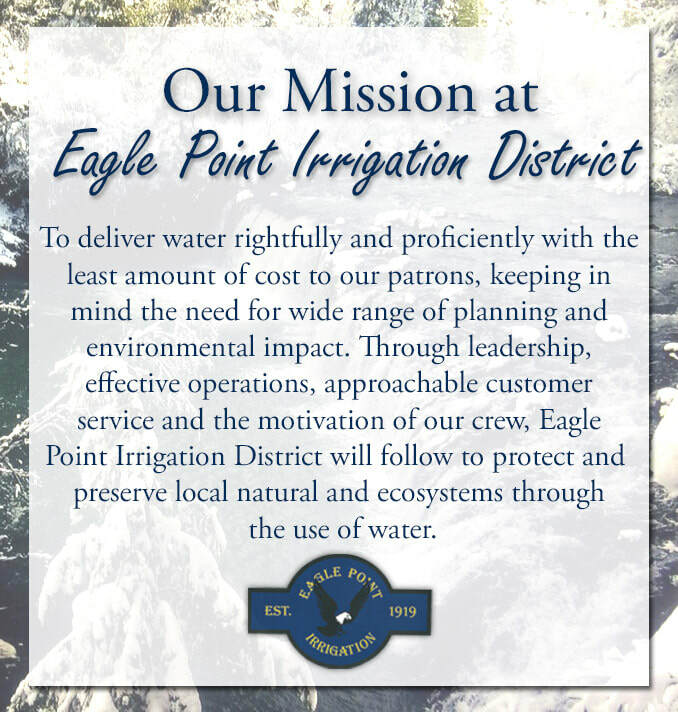 The Eagle Point Irrigation district is located in the beautiful Rogue Valley of Southern Oregon . Manager David Ford is responsible for all the district operations. We provide water to 8,260 acres of land and 540 patrons. The Eagle Point area is known for its quality grass hay produced by the local farmers. The 8 person crew at EPID recognizes the contributions farmers make to our community and we do our best to serve their needs. Our Board of Directors develop and uphold district policies, which includes three members : President, V. President & Director. Each Board member must own property with in our district to be elected by the 540 patrons . Irrigation season starts in early to mid-April and may continue through early October. During water season our crew is dedicated to allotting water as efficiently as possible and preventing interruptions in water flow. During the winter months we capitalize on the water flow to operate our power plant and complete projects and maintenance required for a pleasant operation during water season.